Maya Angelou once asked us to be a rainbow in someone else's cloud, but that's harder than it looks. We're all taught the importance of kindness when young but few manage to make it the focal point of our lives. As a result, kindness becomes a spice rather than the main course, something we try to rise to when the occasion presents itself. While some just talk the talk, however, others spend years driving a ten-ton bus covered in inspirational messages in an attempt to live that message. Bob Votruba's home is a converted transit bus, the second he's gone through over the past eight years. Saddened by the tragic Virginia Tech shootings of 2007, Bob searched for a response to that unspeakable hate. His answer lay at the other end of the spectrum, looking for opportunities to spread acts of kindness wherever he could. 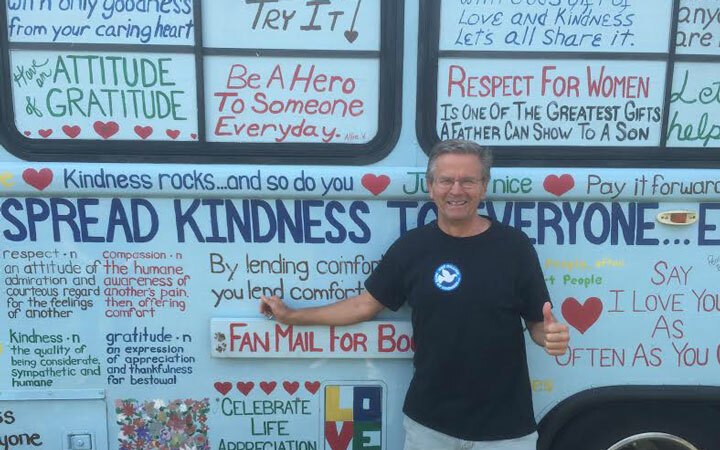 At that rare intersection in life where time, opportunity and passion meet, Bob sold everything, bought a beat-up school bus, and hit the road to dedicate his life to this cause. He gathered family and friends to emblazon his new ride with uplifting quotes and set out to spread the message to all who'd listen. If kindness is love with its work boots on, Bob and his rescue dog Bogart have worn their boots down to the soles. They've traveled the country in an effort to inspire others to take up an important challenge: to commit one million acts of kindness during their lifetime. Bob and Bogart are focusing on putting an end to bullying and adolescent suicide, but Bob encourages everyone to choose a cause that speaks to them. In the end, all roads lead to the same place. His brightly covered bus made its way from Darien to Easton last week before heading upstate. My wife and I arrived early and unannounced Sunday morning at his passenger side door, yet Bob welcomed us like old friends. He spent more than an hour detailing his philosophy and how he came to live out of this aging steel box for the better part of a decade. In short, he believes that sending out positive thoughts and actions literally changes the world around us. One need not look far for proof that this world can use all the positivity it can get. Through his talks to various groups, and students in particular, he stresses the tremendous impact that empathy and generosity can have on both the giver and receiver. While a million deeds takes a lifetime to finish, they include spiritual as well as physical acts. Just as important as holding a door or offering assistance are the acts of refraining from judgment or wishing someone well. Rather than dwell on the size of that daunting number, Bob suggests focusing on the kind thoughts we could generate for just one day. Habits form over time, and the ripple effect of these actions add up. 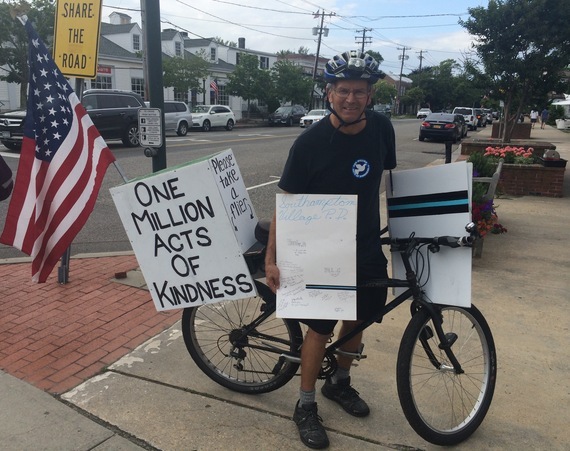 If you're up for this wonderful challenge, visit Bob's website at www.onemillionactsofkindness.com to read the inspiring stories of people who've started their own journey to change the world. While you're there, support his work with a small donation or buy Bogart's new book (rumor has it the release date will be late summer). Leo Buscaglia once said our talents are God's gift to us but what we do with them is our gift to God. Bob Votruba is leaving us with quite a gift. The world needs more people like him, and I encourage you to seek him out when he and Bogart return at the end of summer. It's the one school bus you won't mind driving behind.